Share the post "Shawn Arent Receives 2016 IFNH Director’s Award for Excellence"
Shawn Arent (l), receives IFNH director’s award from Peter Gillies. The IFNH Director’s Award for Excellence is given to a member of the Institute in recognition of outstanding contribution to the vision and mission of the Institute. 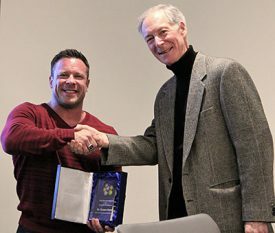 At the annual meeting of the IFNH Extended Leadership Team in December, the Institute’s founding director, Peter Gillies, presented the 2016 award to Shawn Arent of the Department of Kinesiology and Health, Division of Life Sciences in the School of Arts and Science. As a charter member of the IFNH and one of its first formally designated center directors, Arent has led the IFNH Center for Health and Human Performance to a position of scientific excellence in the field of human performance. Last year alone, Arent and its members hosted its 3rd Annual Rutgers Human Performance conference that showcased five keynote speakers and attracted 170+ attendees, produced 20 publications and presentations, presented three invited talks at scientific meetings and delivered guest lectures in England and Ireland. Arent understands the power of partnerships and he has grown the center’s enabling technical portfolio to include Quest Diagnostics, Dymatize Nutrition, Polar Ectro, COSMED and Life Fitness. As new ventures in 2016, the Center began providing training and conditioning programs to over 100 local youth athletes and it now offers personal fitness testing for interested staff and faculty. Not surprisingly, the Center is gaining recognition both inside and outside of Rutgers. Recently, the Center received a lifetime member award from the 3-314th Field Artillery Thunder Battalion of the US Army, an award that has only once been given to a non-military unit. Of special note, news organizations such as Business Insider, Tech Insider, and NY Magazine now view the Center as a “thought leader” resource and “go-to” news source for expert commentary on hot topics in sports fitness and nutrition. With over 1400 followers on Facebook and three million views of its online video series, the Center sets the bar for creating presence and identity for the institute. With recognition comes opportunity, which is why Arent was recently appointed a Fellow in the International Society of Sports Nutrition and elected president of the Society. For more information about Arent and the IFNH Center for Health and Human Performance, be sure to check them out at ifnh.rutgers.edu.